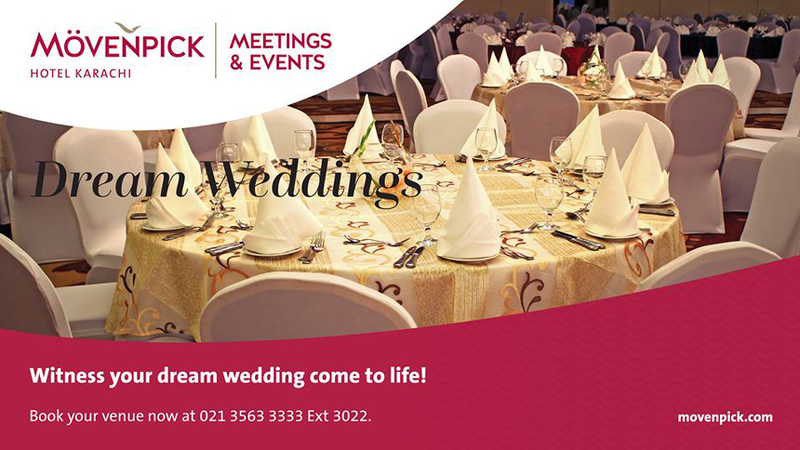 Mövenpick is a Swiss group of companies with a global reach. Its core competency lies in the hospitality business with restaurants, hotels, wine trade and premium branded products. Mövenpick is organized as a holding company with four independently operated business units: Mövenpick Hotels & Resorts, Marché International and Mövenpick Restaurants, Mövenpick Wine and Mövenpick Fine Foods. Mövenpick is represented in Europe, the Middle East, Africa, Asia and North America. Mövenpick Hotels & Resorts is an international upscale hotel management company with over 16’000 staff members, is represented in 24 countries with 80 hotels, resorts and Nile cruisers currently in operation. Mövenpick Hotels & Resorts enjoys an enviable international reputation for quality, reliability and care with a personal touch. The company is also famous for its innovative approach to culinary excellence. More than 30 properties are planned or under construction, including Chiang Mai and Koh Samui (Thailand), Dubai (UAE), Sanya (Hainan Island, China) and Djerba (Tunisia). 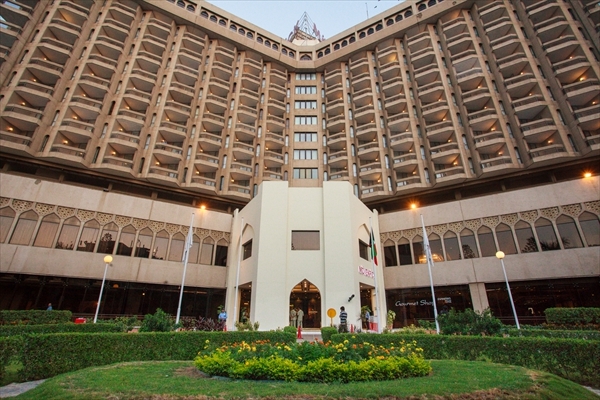 Mövenpick Hotel Karachi is a five-star destination for business, dining and recreation. Mövenpick offers world-class cuisine and warm, attentive service. 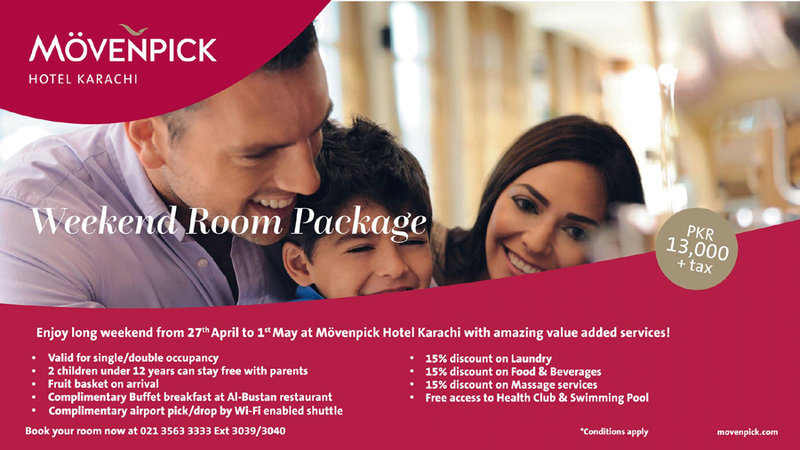 Mövenpick Hotel Karachi looks forward to build on this wonderful legacy with its international experience and unique sense of Swiss hospitality. Swiss efficiency in service and first-class gastronomic excellence are embedded in the DNA of Mövenpick. 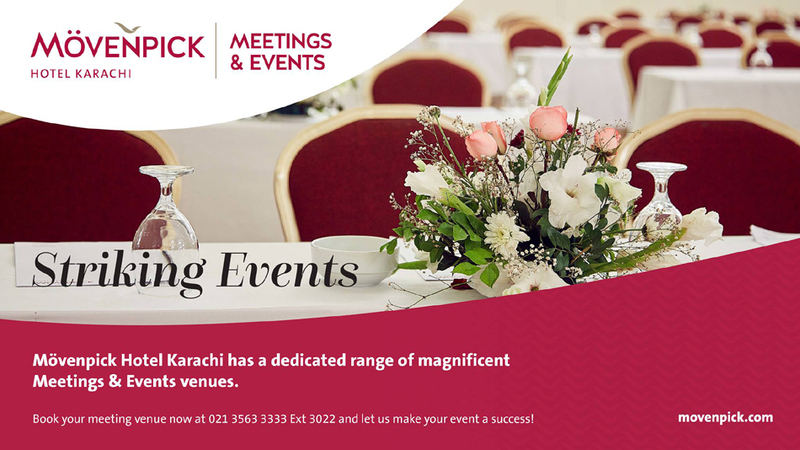 Just 17 kilometers from Jinnah International Airport and situated in the centre of Karachi’s business district, the 407-room Mövenpick Hotel Karachi is a five-star destination for business, dining and recreation. Business travelers can make use of our extensive conference and event facilities for up to 1,000 people. Kemari Harbour and the city’s nearby beaches are leisure highlights and there is easy access to local shopping and sightseeing destinations. Our hotel is situated in a prime downtown location at Club Road, adjacent to the Chief Minister and Governor’s House. Commercial business locations, local shopping destinations and upscale restaurants are nearby, with beaches and cultural highlights also easily accessible from the hotel. Jinnah International Airport is just 17 kilometres away. Wazir Mansion 8.0 km/5.0 miles, Quaid's Mausoleum 9.0 km/5.6 miles, Chaukhandi Tombs 29.1 km/18.1 miles, Thatta (historical site) 100.0 km/62.1 miles, Haleji Lake 110.0 km/68.3 miles, Mohenjodaro (historical site) 200.0 km/124.3 miles. Zoological Gardens 7.0 km/4.3 miles, Sports City 10.0 km/6.2 miles, The Arena 13.0 km/8.1 miles, Beaches 18.0 km/11.2 miles, Alladin Water Park 22.5 km/14.0 miles. National Museum 2.0 km/1.2 miles, Mohatta Palace 5.0 km/3.1 miles. Saddar Market 0.8 km/0.5 miles, Zainab Market 0.8 km/0.5 miles, Uzma Arcade 3.5 km/2.2 miles, Forum Mall 3.7 km/2.3 miles, Park Towers Mall 5.2 km/3.2 miles, Tariq Road 6.8 km/4.2 miles, Millennium Mall 13.4 km/8.3 miles. Currents Offers: Special Wedding and Room Packages. Please call to inquire. What to Expect: Very friendly and attentive service in all areas of the hotel. A relaxing and refined atmosphere. An ideal, upscale environment for business travelers. Our hotel offers 407 comfortable guestrooms divided into Classic, Deluxe, Executive and Suite categories. Wake up rejuvenated and relax with in-room tea and coffee while enjoying city views. Executive Rooms are ideal for business travelers and those who prefer some additional comforts like Executive Lounge access and free, unlimited internet. For even more space in an upscale environment, we offer one and two-bedroom suites. Mövenpick Hotels & Resorts are renowned for creating wonderful restaurants and amazing food. Our five dining destinations in Karachi offer a great mix of incredible food from diverse parts of the world, plus wonderful ambience and superb service. 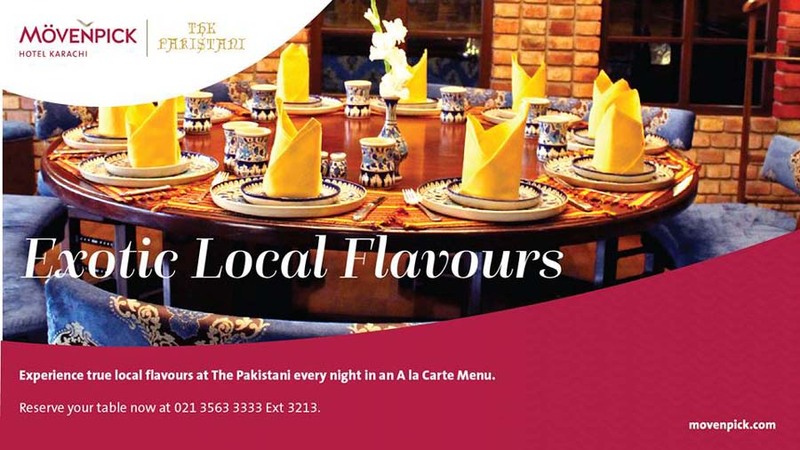 Guests can savour authentic Pakistani cuisine in the heart of Karachi at our signature restaurant, The Pakistani. For food from further afield, our Lebanese restaurant Kabab-Ji creates sumptuous Middle Eastern delicacies including hot and cold mezze. La Mamma prepares much-loved classic Italian dishes and pizzas. 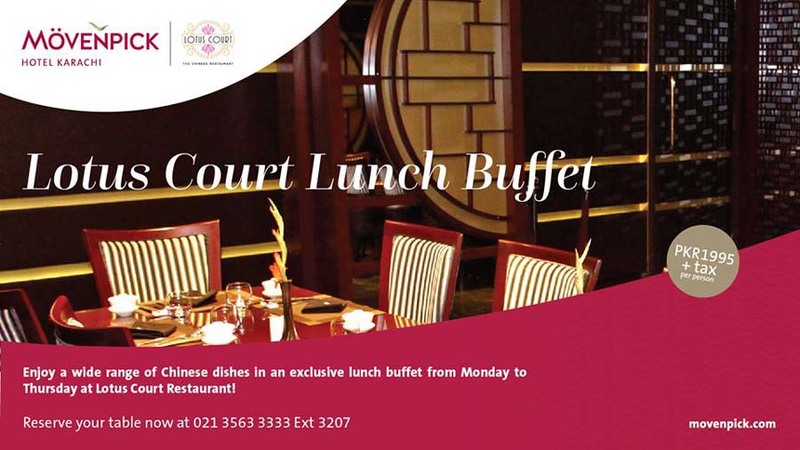 Lotus Court, the new Chinese restaurant offering lunch buffet on weekdays and Fanoos Lounge serves light meals and the best coffee in Karachi, 24 hours a day. Lotus Court aims at redefining the idea of going out for Chinese food. Lotus Court offers appetizing authentic Chinese cuisine, with a menu that truly sets this restaurant apart. Lotus Court offers a variety of traditional Chinese fare, making each entrée seem like something new and special. The menu items and atmosphere help to create a high-value experience for customer, differentiating Lotus Court from what people often picture when they think of a typical Chinese restaurant. The kitchen can be seen through a transparent glass surrounding the dining area. This concept allows activity in the kitchen to be part of the whole dining experience, with diners treated to a live show on how their food is prepared. Hanging overhead are custom-made contemporary Chinese chandeliers and accents, which help create a marriage between traditional oriental culture and the contemporary atmosphere. • Lunch Buffet is offered Monday-Thursday; Rs. 1995+ tax. The atmospheric Pakistani restaurant serves traditional Pakistani cuisine. Exquisite local specialties are served directly from the grill and this is a very special dining experience. The warm atmosphere in this cozy restaurant is further complemented with live musical entertainment. Up to 120 guests can dine in The Pakistani. Pakistan's food varies from region to region but most dishes are renowned for their flavour, aromatic spices and diversity. The restaurant offers special dishes from each of the provinces of Pakistan. From the Punjab side, we offer Mughal cuisine (using Tandoor ovens); Sajji from Baluchistan (barbecuing lamb) and Palla (fish) from Sind. The restaurant design incorporates traditional decor and antique woodwork, giving a very atmospheric ambiance. With live Ghazal singing, this is a superb choice for an unforgettable dining experience. Up to 120 guests can dine in The Pakistani. A fantastic breakfast buffet, classic international à la carte choices and excellent Pakistani food are just some of the things you can look forward to at Al Bustan. A special place where our guests can select interesting food at any time of the day. Our all day dining restaurant with buffets and an à la carte menu. 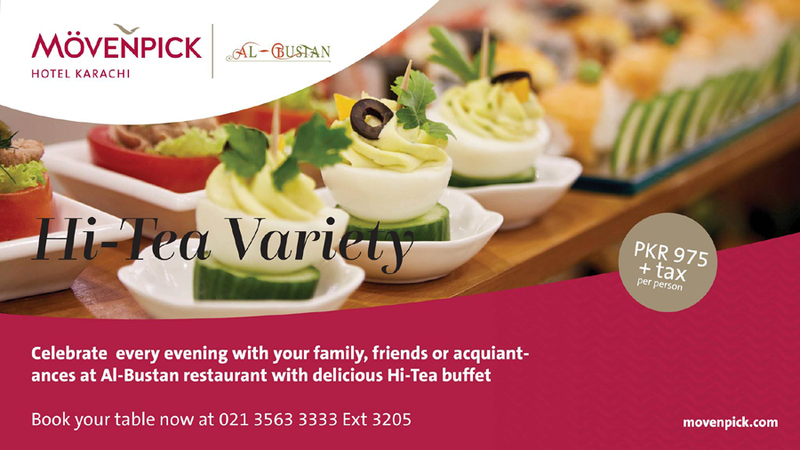 At Al Bustan, our guests can choose from our extensive buffet or à la carte menu for great food throughout the day. Pakistani cuisine forms a big part of the offering and is complemented by a variety of international dishes. This casual, all-day dining restaurant is open every day, for breakfast, lunch and dinner and seats up to 272 guests. 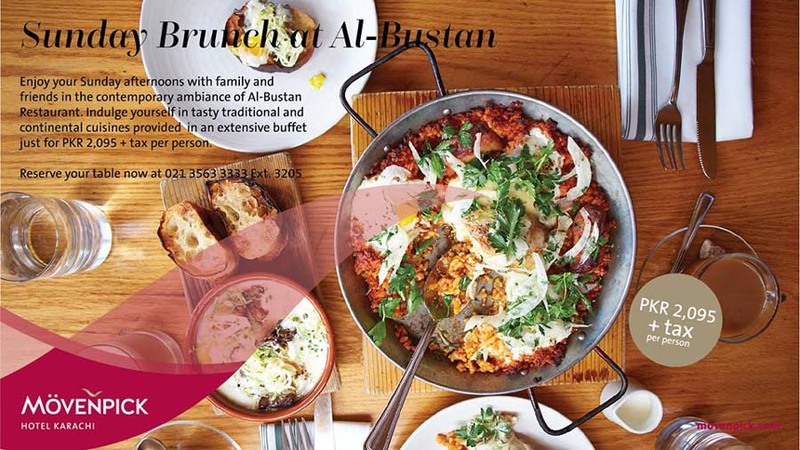 The Al Bustan interior reflects elements of a garden for a relaxed atmosphere that makes this restaurant so popular. The Sunday brunch buffet with live music is a highlight and a very entertaining dining experience. Kabab-Ji is our authentic fine-dining Lebanese restaurant serving exotic Middle Eastern fare, traditional and regional favourites and a selection of mezze. The restaurant opens for dinner only and our Lebanese chefs will cook for you with passion and style. Our authentic Lebanese restaurant with an à la carte dinner menu. Our Lebanese restaurant, Kabab-Ji is the only Lebanese restaurant in a 5 star hotel in Karachi. Kabab-Ji serves traditional Lebanese favourites and unusual Arabic creations in an elegant ambience. The live, open kitchen contributes to this exciting dining experience. The specially tailored menu at Kabab-Ji makes it easy and enjoyable to experiment with a wide range of hot and cold mezze and authentic recipes that will entice even the most well-travelled guests. Popular dishes include the Sheesh Taouk and Dawood Bhasha. The restaurant is located on the mezzanine floor where our Lebanese chefs will cook your dinner with passion and style. 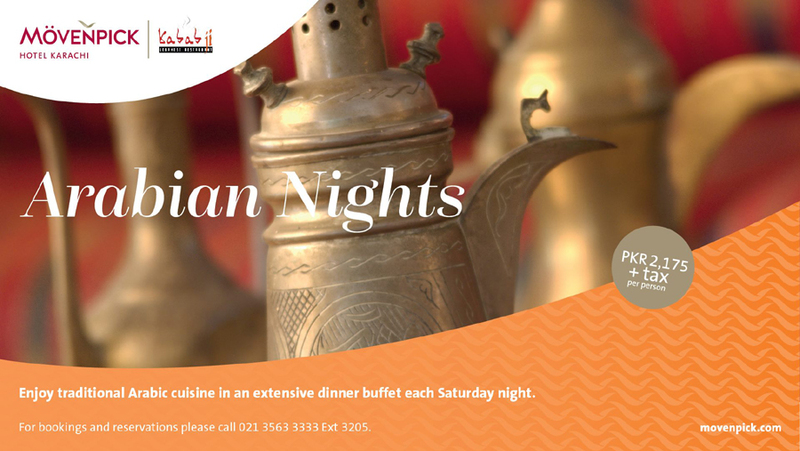 Special themed evening buffets on specific nights include 'Middle Eastern Night' and 'Arabian Nights' for up to 73 guests. La Mamma is a vibrant, contemporary Italian restaurant where our guests can indulge in Italy's most revered legacy to the world - food. With a menu packed full of classic Italian favourites including pizza and pasta, this restaurant is open for lunch and dinner. 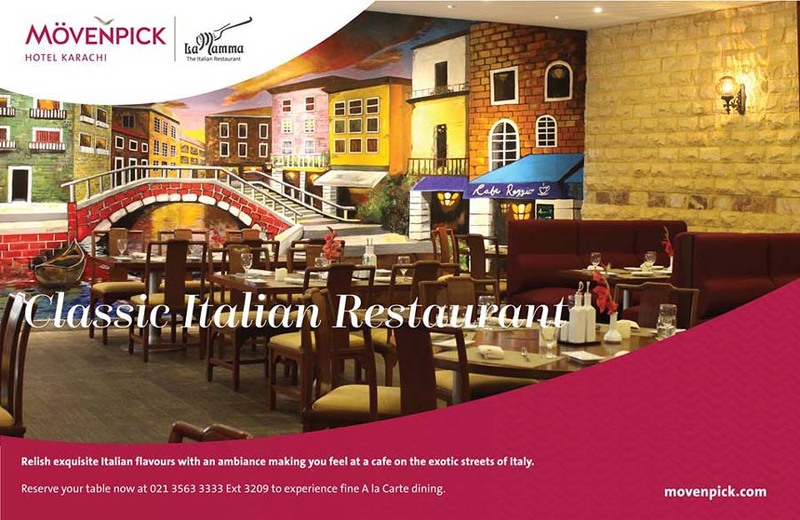 Vibrant restaurant which serves Italian specialties. La Mamma is a lively and relaxed restaurant serving the best of Italy on a plate. Offering both buffet and à la carte, La Mamma features a vast selection of Italian favourites for lunch and dinner. Some of the restaurant's highlights include 'petto di pollo', buffalo mozzarella with tomatoes, gnocchi, Caesar salad, antipasti, pizza, pasta, meat, fish and vegetarian meals. Cheese and delicious desserts like tiramisu, zuccotto and cassata are served to ensure a fantastic end to your Italian meal. The restaurant can host up to 95 guests and is ideal for relaxed get-togethers and special occasions. Great coffee and tantalizing snacks. Open 24 hours a day for coffee and snacks, Fanoos is a great place to meet up and chat over mouth-watering local and international light bites and the best coffee in town. Don't miss out on the fantastic Mövenpick ice-cream. Our round-the-clock coffee shop is a cheerful spot with a lively atmosphere and live band that performs here. Up to 110 guests can enjoy local snacks and light meals here at any time of the day or night. 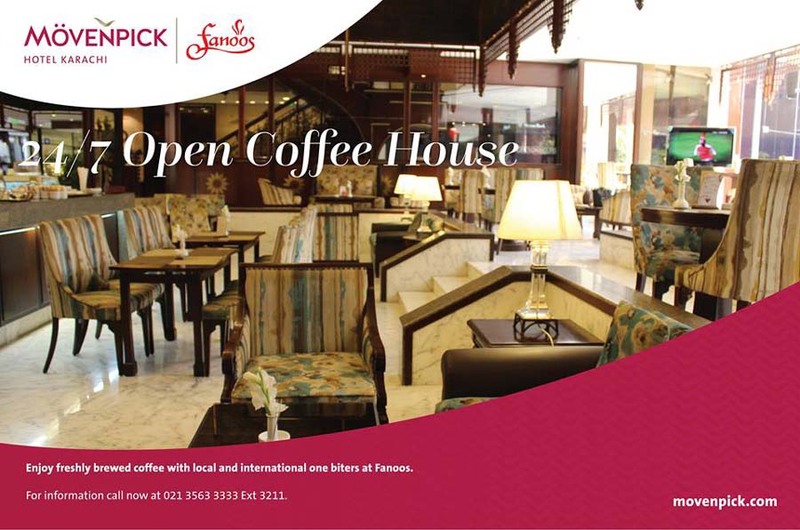 Fanoos Lounge is located in the hotel lobby and is a great place to meet up with friends or colleagues. 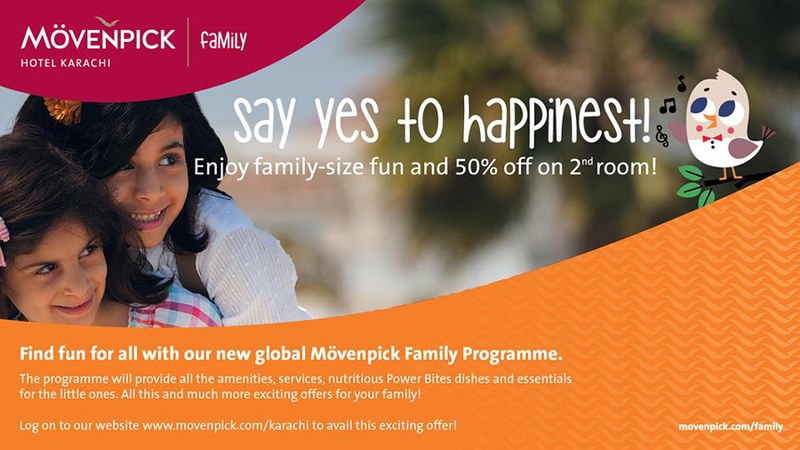 Enjoy your leisure time at the Mövenpick Karachi. Take a dip in our outdoor heated swimming pool or try out the health club and floodlit tennis courts. Our outdoor heated swimming pool and floodlit tennis courts are complemented with a health club that includes a gym, aerobics room, sauna, steam room, jacuzzi and massage facilities to ease the tension from tired muscles. We also have Executive Boardrooms which are equipped with an in-room speakerphone, fax machine, scanner, copier, printer, multi-system television and a motorized screen with overhead projector. Built-in multimedia systems can be operated from a centralized control panel on the table. We provide you with ideas and find for you the ideal and tailor-made programme. Together with third party specialists we offer a variety of supporting programmes for private and business events. We also adapt and implement our event suggestions completely according to what you have in mind. Whether you come as a company, club or private group, our offers will inspire you. Would you like to encourage the motivation of your employees? Do you want to optimise ongoing team-building or do you just want to get to know your colleagues in action in a creative way? Foster team spirit or even get out into the green with a healthy sport event in or around the hotel and resort. Celebrate with your company. Celebrate the successful completion of a project or the kickoff into a new year. Why not combine this with recognition awards for employees or special team building outings where participants get to know each other better. Planning the happiest day of your life is an exciting step. We are eager to make this special day unforgettable for you and for your guests. Our team will help transform all your wishes into reality - be it a wedding on the beach, set amongst trees in the hotel gardens, or beneath the stars of the night's sky - we'll make it perfect. There are great ways to have a break from the seminar room: Trabi safaris through the city in Berlin, Body Flying in Zurich, chocolate making courses in Istanbul, tours in the dark in Hamburg, or even Lake scuba diving in Geneva. There are no limits to your imagination and nothing we can't organize. Movenpick Hotel of Karachi, Pakistan.